In the beginning Amaterasu the Goddess of the Sun, ruled the heavens and the Earth together with her brother Tsukuyomi the God of the Moon. One day Uke Mochi the Goddess of food offered Tsukuyomi some food that so disgusted him that he killed her. 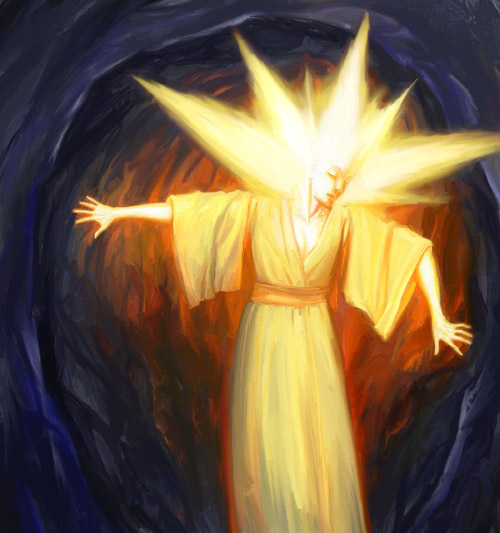 Amatarasu was so outraged by his actions, she retired to a cave plunging the World into darkness. All the trees bearing fruit died, nothing would grow anymore, everyone was living in a state of darkness and despair. So the people devised a plan to bring Amaterasu back. They unearthed a tree and placed a mirror on it, then went to her cave and pretended to have a big festival with music and singing so loud that the Sun Goddess was intrigued, how could this happen with no light in the World? She moved the big stone blocking the entrance of the cave and went out. She sees another Sun, not knowing it is her own reflection. Quickly the people move behind her creating a magic line in the soil that she cannot cross and preventing her from going back fully into the cave. So each night she retreats into the cave as far as the line permits and each morning she emerges bringing light and joy and refreashment to the World. oh we? who all? haha sorry if im being too annoying. it’s great to see what you’re sharing haha. Thanks, when I say we I mean my sweetheart lady and myself, glad you like it. Good luck with your band !! ohhh you and your lady 🙂 nice! and thank you haha. although I’m just the blog artist. You live with me my love?